LogWare lets you acquire data to your PC graphically and store it to a text file. It also performs statistical functions automatically on each data set. The setup is so easy you won’t need to read the manual to use it. 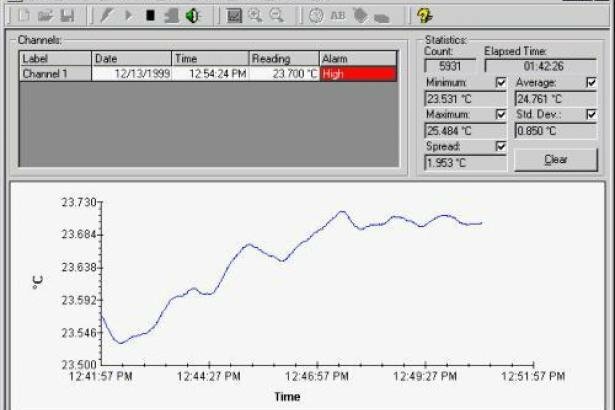 LogWare was designed for temperature data acquisition. Set high and low alarm conditions, program a delayed start time, store a data log for a fixed number of readings or length of time, program the acquisition interval from 1 second to 24 hours, and then let the software take readings from the readout while you get the rest of your work done. During a log session you can view the data in a time/temperature trend graph while the data points are stored to a file on your PC. Output the graph to your printer, view the test points from a spreadsheet, or review the pertinent log statistics once your log is completed. If you have a Model 1522 LLL Data logger there’s even more you can do. The 1522 stores up to 10,000 data points in multiple log sessions. Once you’re back to your PC, you can use LogWare to download the data into individual log sessions and view each one separately. Take the 1522 out in the field, store readings from your freezers, ovens, chambers, and anywhere else you need to record temperature, bring it back to your PC, and LogWare will separate each log session into individual data sets. You don’t have to load the text file into your spreadsheet and try to figure out which data points went with each log session. LogWare does all that for you. For faster downloading from the 1522, we’ve provided an IR link in addition to a standard serial interface. Beam your data at high speeds, or use the standard RS-232 link. LogWare also gives you the ability to make configuration changes to your readout. Program your probe coefficients, write calibration data to your meter, set passcode-protected parameters, and other tools specific to your readout all from your PC in user-friendly Windows screens.